Can you do these magic tricks? 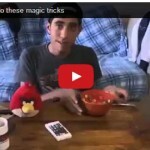 Written by Hitpunjab	| June 9, 2014 | Comments Off on Can you do these magic tricks? This is really an amazing and interesting magic tricks video. The things happening in this video are not really the same as we see. This all could be tricks or excellent video editing technique. But anyways it is really awesome and interesting. This video is certainly gonna entertain you guys. The video was uploaded a week ago on YouTube by Ameer Abo Saleh. Though it has not racked millions of YouTube views but still it is very interesting and watchable video. In the first trick you see a guy is holding a juice bottle and inverts it on the table. Magically you see candies coming out of the juice bottle, really interesting. In the next trick a glass is placed upon a table containing a small fish type thing into it. The guy has some different color small sheets in his hand and whichever sheet he uses to hide the glass from the camera, the fish type thing turns into the same color as of the sheet. And when he uses white sheet the glass gets vanished. The third trick is about changing the color of socks. The guy is wearing brown printed socks and when he strikes his foot with each other, the color of socks gets changed. He does it three times and then starts shaking his foot on one of the Hindi songs. In the next trick, the guy is sitting in front of his laptop screen, he is watching another guy in the video. Then he prepares himself as the guy in the video throws some thing on him. Really interesting, how can a thing come out of the screen ? In the next trick he is standing on a roof, he suddenly waves his hand and you see a paper comes in hands from somewhere, which i don’t know, after that he makes the paper disappear. In the next trick he changes the color of his jacket and changes his cap. He does some other amazing tricks as well. Thanks for watching this amazing magic trick video and i hope you guys liked it.